Did you already get yours? Which style do you prefer, classic or rock? You know that I'm a classic girl at heart when it comes to fashion so I'm with you on choosing a traditional black motorcycle jacket. This is a piece that I've been wanting to add to my wardrobe but I can never find the right style/fit. Can't wait to see yours :) Happy weekend Lilli! Non è priavera senza la mia amata biker jacket! Biker jacket è molto bello, un capo che adoro! I agree with you, dear Lilli. 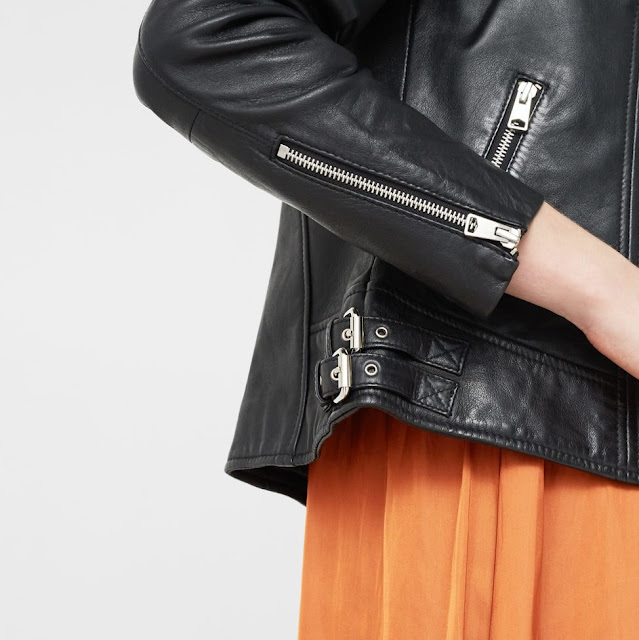 Every woman should have a biker-Jacket in the closet. My leather jacket is a few years old, but i wear it ever and ever again. Such a Jacket gives so much styling-combination. Even wit an evening-dress a biiker jacket looks fantastic. I prefer a black one, but at my wish list i got a red leather jacket. I want to have a Saint Laurent jacket one day. One day! Have a nice weekend. Motorcycle leather jacket is so cool. Love the zippers and leather combination. Can't wait for the weather to be better for this fashion. Have a wonderful weekend.